Canada has a strong reputation as a valued trading partner and 2019 is posed to be a notable year for Canadian exporters. More businesses will seize the chance to grow and expand into new markets and drive higher global revenues. While there are significant opportunities available to businesses going global, such as vast marketplaces and reduced tariffs, there are also considerable risks involved in the process. One of the organizations committed to mitigating the risks of international expansion and supporting Canadians in their export journey is Export Development Canada (EDC). Export Development Canada (EDC) is Canada’s export credit agency. It supports and develops Canada’s export trade by helping Canadian companies respond to international business opportunities. It is a self-financing Crown corporation that operates at arm’s length from the government. EDC Canada provides a wealth of business solutions and exporting resources, including trade-related webinars which discuss topics such as entering specific markets, scaling technology, and how to manage international business. Export Development Canada regularly hosts webinars covering a wide range of trade-related issues. Below are five on-demand webinars providing insight on how to successfully reach new international markets. Before your product or service is ready to enter a new international market, there are many factors that need to be considered. Is the market reachable? What are the specific risks involved? During the How to Find Your Next Target Market webinar, listeners will receive insight on how to approach international markets, logistics planning to consider, and how to mitigate the risks of expanding markets. In order for your company to be ready to enter a new market and sustain its competitive position, there are several steps to consider first. During the Five Steps to Taking on Your International Competition webinar, you will learn how to benefit from international networks and partners, strategies for entering new markets, ways to offer competitive payment terms, how to use innovation as a leg up, and how to understand what sets your business apart from the rest. Companies in Canada’s information and communication technology sector (ICT) face unique challenges in the process of getting ready to serve global markets. The How to Scale Your Technology Company and Go Global webinar will provide tips and tricks for scaling up based on economic data and industry forecasting. Learn how to access capital when looking to grow your business, find and recruit ICT talent, compete against companies from Silicon Valley, and capitalize on government funding resources to increase international sales. 2019 is set to be a great year for Canadian exporters. The Fall 2018 Global Export Forecast webinar will provide listeners with a general overview of what’s happening in export markets and where your business can find new opportunities. Learn where to focus your export efforts, diversify your markets, and understand the state of the Canadian export market on a provincial and federal level. Protecting intellectual property (IP) is crucial when it comes to an international expansion plan, so it’s important to know what measures to take from the very beginning. The Protecting IP in Global Markets webinar will provide Canadian exporters with valuable solutions to expand their IP in global markets. Learn how to use intellectual property to access international markets, strategies for avoiding IP breaches, and how to build a successful IP strategy. Many Canadian businesses have untouched international markets where their product or service could succeed, but are unaware of the support available to help reach these markets. One of these resources is federal and provincial government funding. Through a range of programs, companies can secure government grants to streamline the process of entering new markets and reduce the risks associated with exporting. 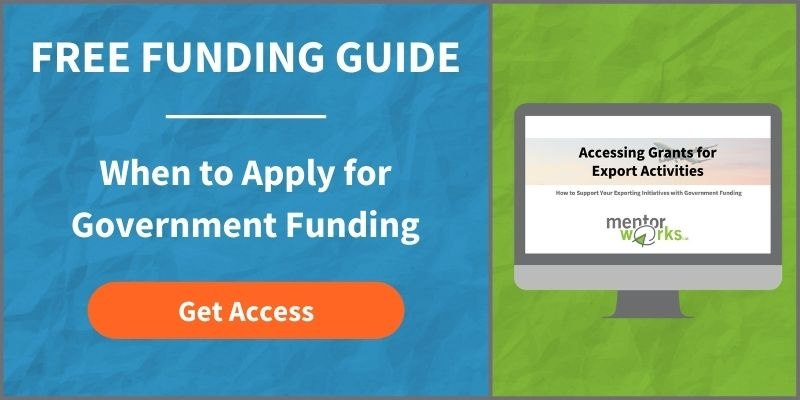 Mentor Works has compiled four of the most popular export expansion funding programs in the Accessing Grants for Export Activities slide deck. It is a valuable reference for those interested in taking their company to global heights and seeking opportunities to advance, manage, and finance their business’ strategic projects. Download the Accessing Grants for Export Activities slide deck to learn how export development grants can support the international growth of your business.